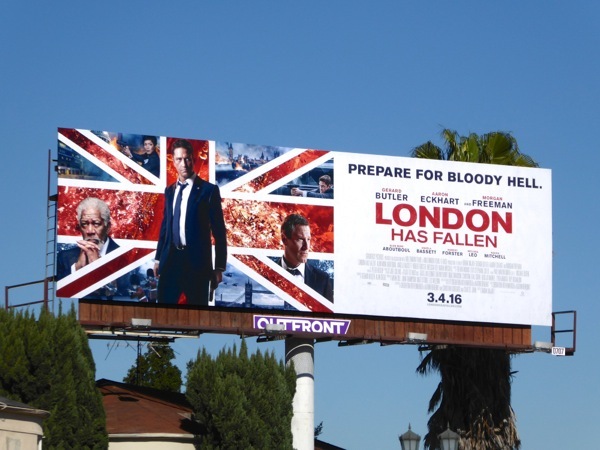 Not content with destroying America many times over in films like Independence Day, The Day After Tomorrow, Godzilla and San Andreas, Hollywoodland has set its sights on blowing up Britain in London Has Fallen. 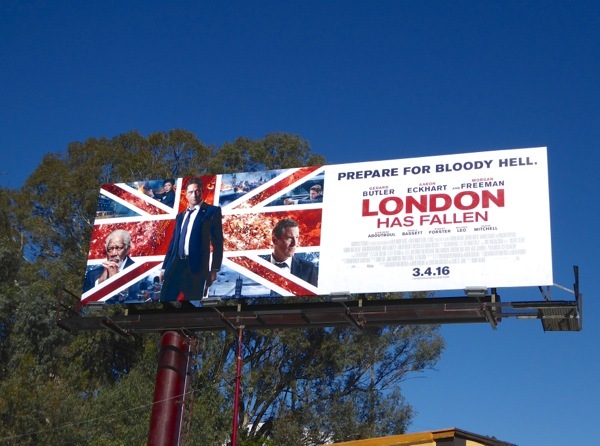 Yes, London had better 'prepare for bloody hell' as Gerard Butler, Aaron Eckhart and Morgan Freeman return to try and cheat death again in the sequel to 2013's Olympus Has Fallen. In the first movie Butler's disgraced former Secret Service agent saved Eckhart's U.S. President from terrorists who attacked the White House, and beat similarly-themed action movie White House Down to the box office by several months. 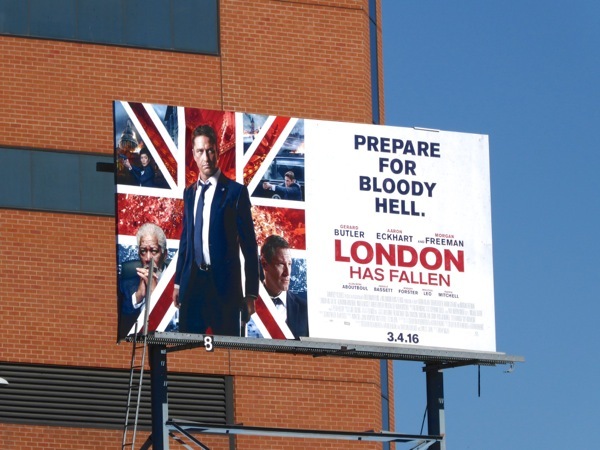 This time all the world's leaders are targeted by shadowy forces as they attend the funeral of the British Prime Minister after his suspicious death. 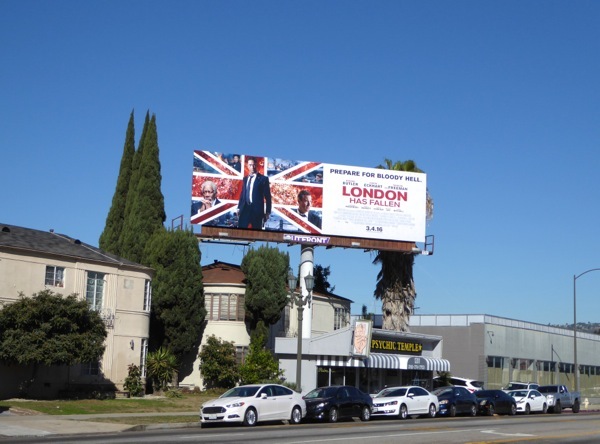 These London Has Fallen billboards flying the Union Jack were first spied on February 4 along La Brea Avenue, and then later spotted along La Cienega Boulevard and San Vicente Boulevard through February 9, 2016. 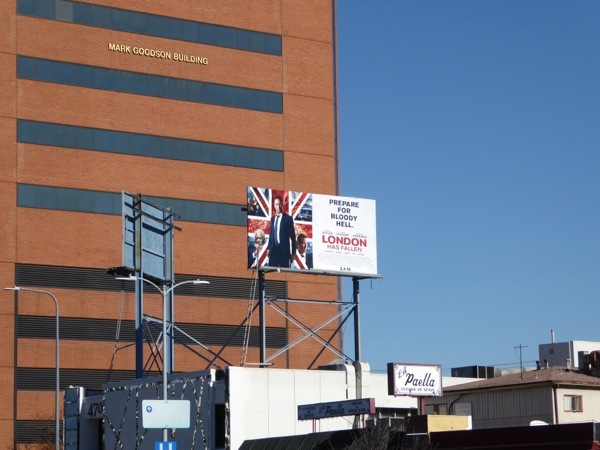 If you're a fan of the film franchise, be sure to check out these Olympus Has Fallen movie billboards. 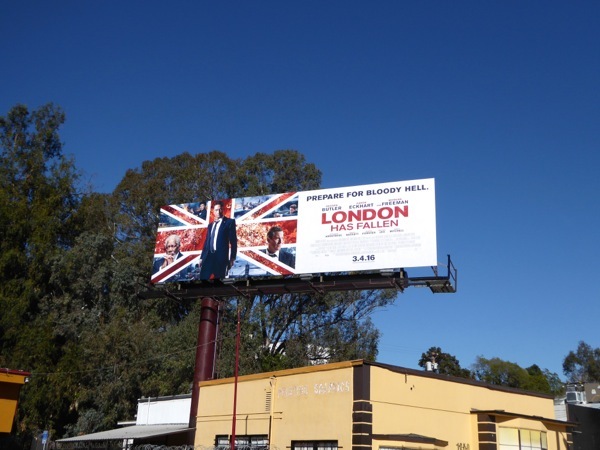 Plus you can also see more of Gerard Butler in this Machine Gun Preacher movie billboard and Playing For Keeps film billboard. Now if this sequel is a success what could possibly come next, Moscow Has Fallen, Beijing Has Fallen, Rio Has Fallen or even Frankfurt Has Fallen? Sorry, couldn't resist that last one.